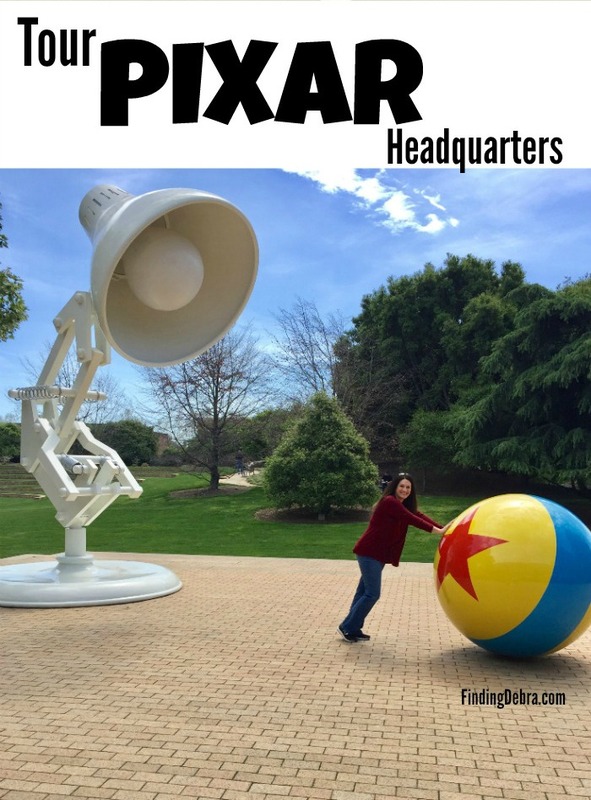 Over the past few years, when in Burbank, California for official business, I’ve had the privilege of walking around the Walt Disney Studios lot. It’s not something I take for granted, as unlike many working studios today, the Walt Disney Studios is a closed lot and not open to the public for tours. Having the ability to not only walk the streets and corridors where Walt Disney roamed, but to do so freely at times, has been an incredible gift. 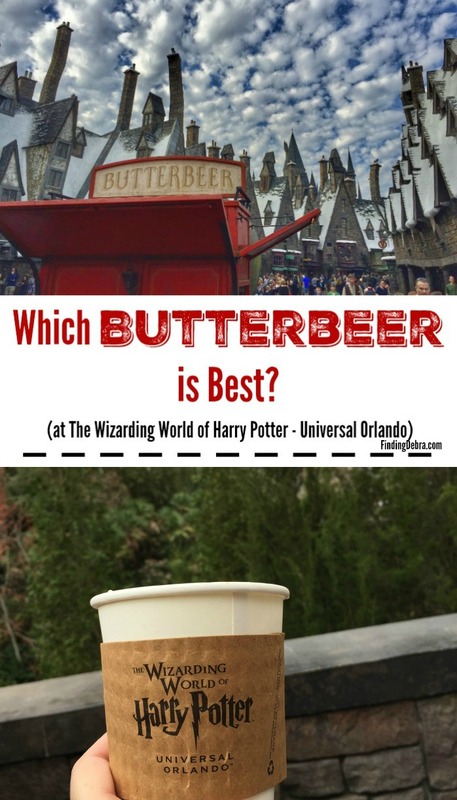 A prime example of this was the recent Disney Scavenger Hunt at Disney Headquarters! 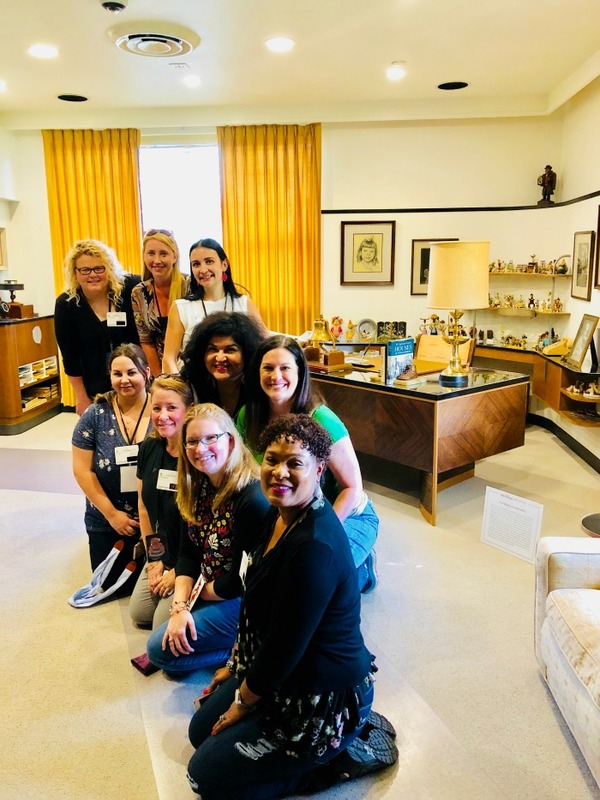 And just minutes before I experienced that, I had the distinct privilege to do something I had never done before – Tour Walt Disney’s Office! 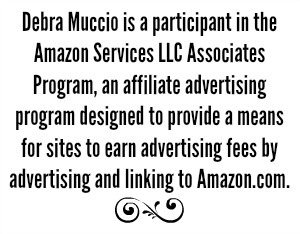 Follow along as I take you on a tour. 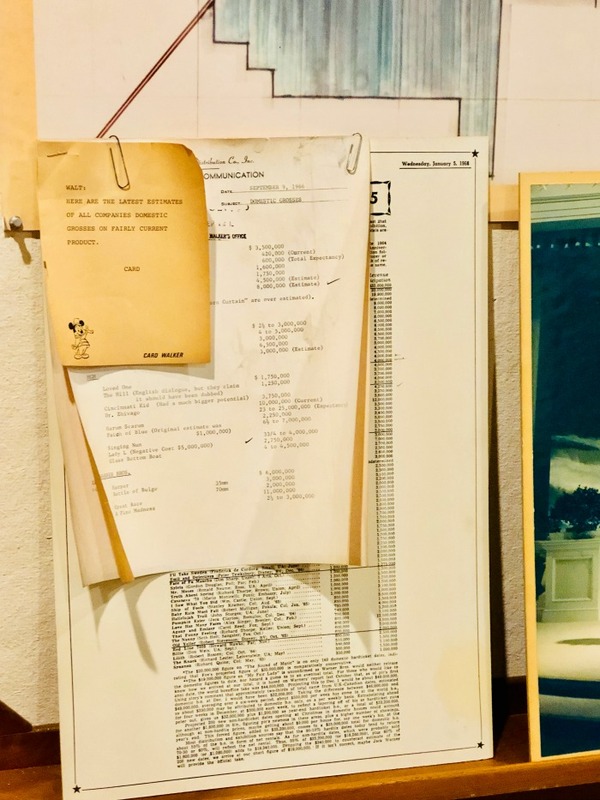 It wasn’t all that long ago that I had been standing just outside Walt Disney’s office, taking photographs throughout the lobby and hallway in the old Animation building. Walt Disney’s office isn’t open to the public. It’s not even open for employees to tour. 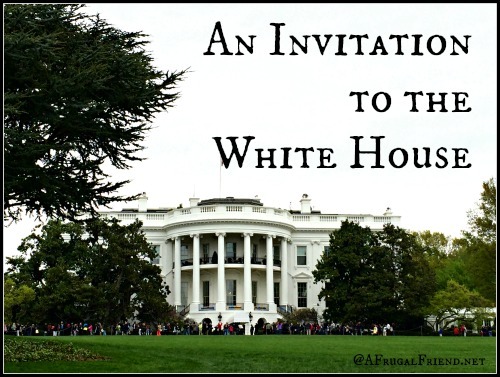 It’s only opened by special invitation. 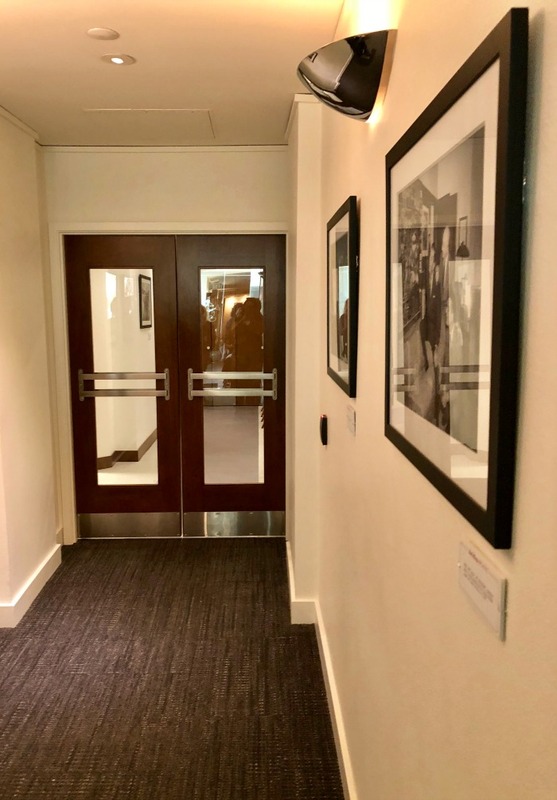 It was in November of 2017, during my COCO trip, when I would walk slowly along this hallway, and the two others below it, looking at each photograph. 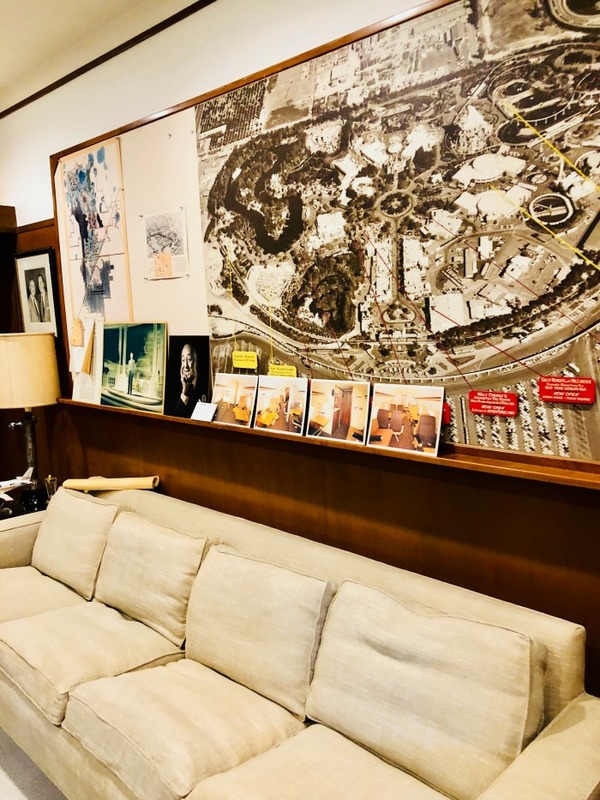 I would sit in the oversized lobby, imagining Walt Disney and the countless film stars and celebrities of the day walking through this space and into Walt Disney’s office. This time would be different. I would be walking inside myself. 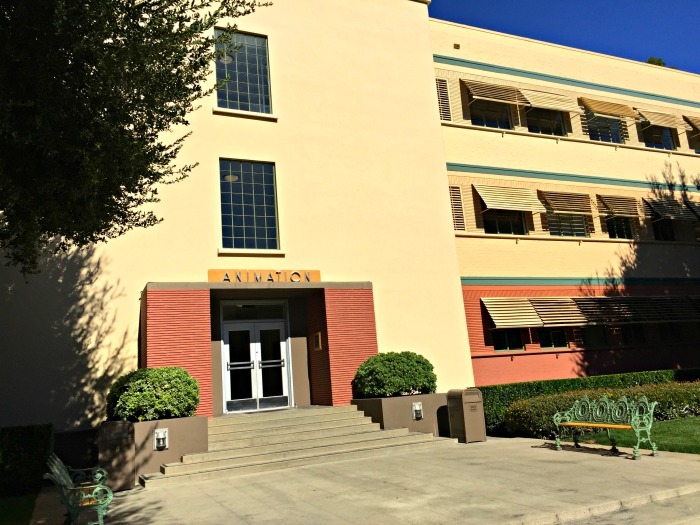 Walt Disney’s office was located at the heart of the lot – third floor of the Animation Building’s H-Wing. The design of this building, with incredible windows, was made to help animators work with as much natural light as possible. Here, on the third floor of the old Animation building, is where Suite 3H is located. 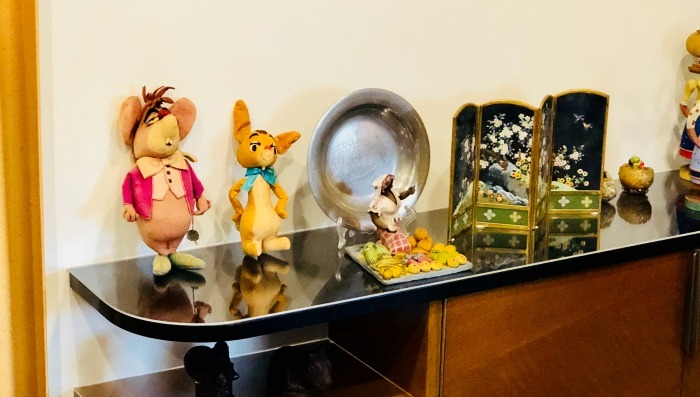 Suite 3H – The Offices of Walt Disney. 3H is a series of offices, not a singular office, located right through these doors. Walt Disney himself occupied Suite 3H from 1940 until his death in 1966. 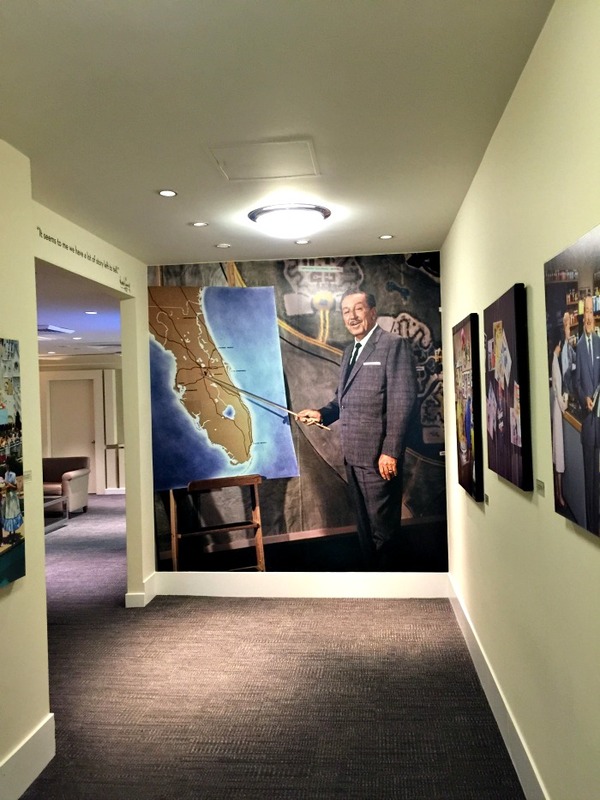 Though others had occuped 3H since the time of Walt’s death (Disney Presidents and CEOs like Frank Wells and Michael Eisner), in 2015 Suite 3H was completely renovated and reopened as a permanent exhibit honoring Walt Disney. This renovation was remarkable. Having seen it firsthand, I see the painstaking detail the Studios went through to get everything just right. 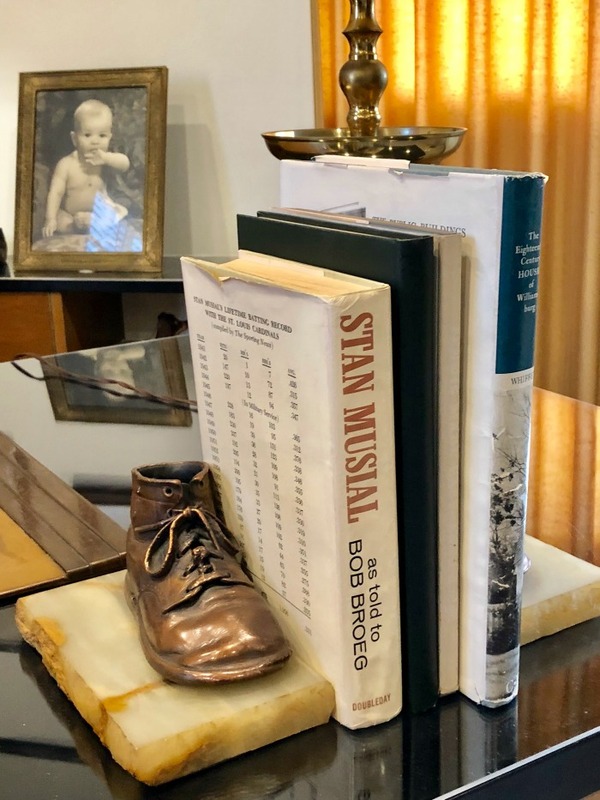 This was able to be done thanks to the hard work of Dave Smith, who founded the Walt Disney Archives and inventoried all the materials in Walt Disney’s offices. What we see today when touring is identical to how it was when Walt Disney worked here. His personal items have been brought back into the rooms. It’s like going back in time, with ashtrays on every desk and dated curtains on the windows. 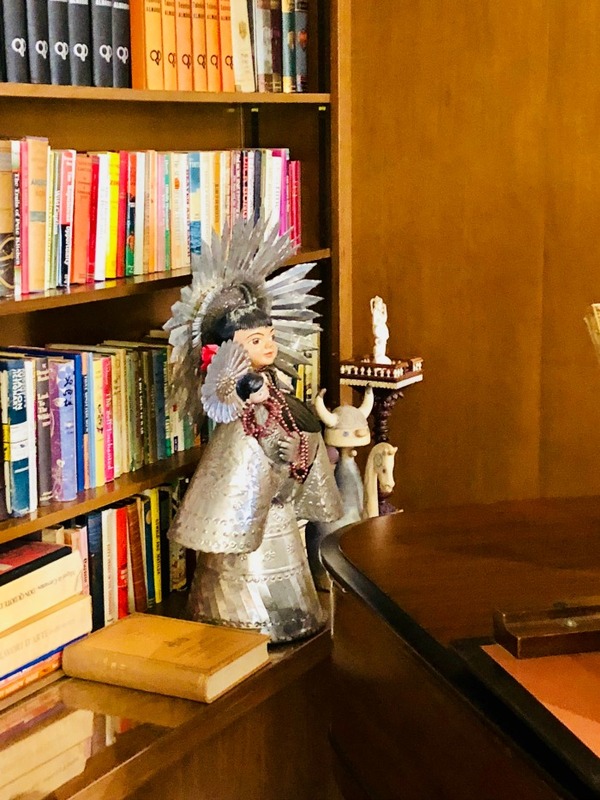 With just a glimpse of the secretary’s office, you can quickly see how dated it is. Typewriter. Rotary phone. And the journal on the desk? Walt’s actual calendar of his comings and goings. Oh, what I wouldn’t have given just to browse through that a bit. They were the gatekeepers you had to go through to get to the man himself. Walt had 2 offices, this was the first one would come to, his formal office. This is where Walt would meet important guests visiting the Studios. 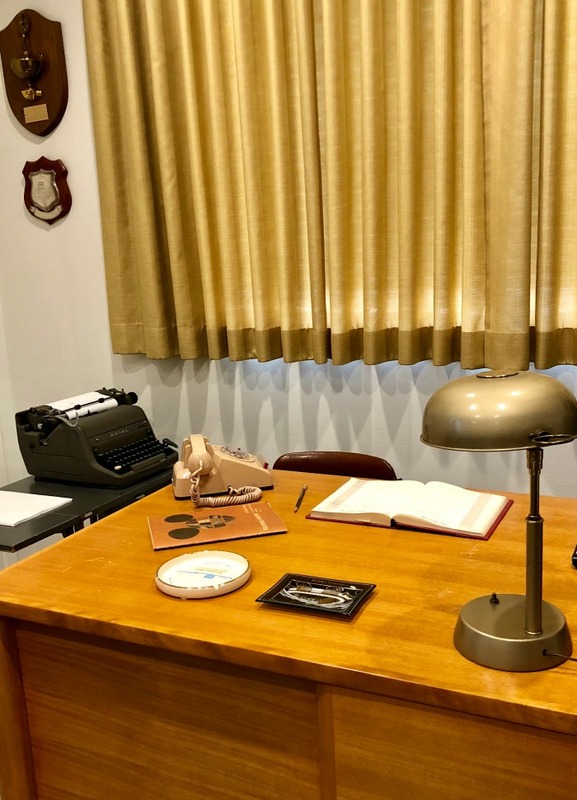 Everything you see in these offices are the original items that were used by Walt himself. 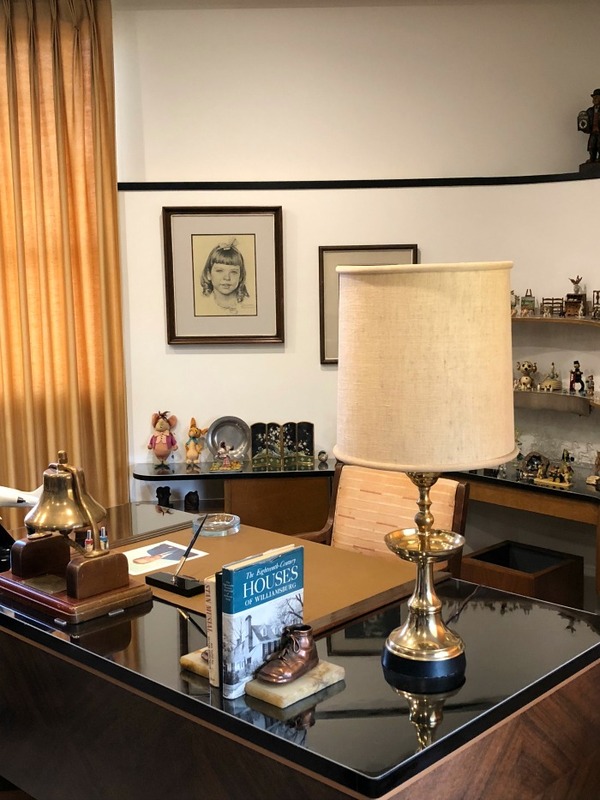 From colored pencils on his desk to the Norman Rockwell sketches of his daughters, this office was a representation of all that was important to Walt. 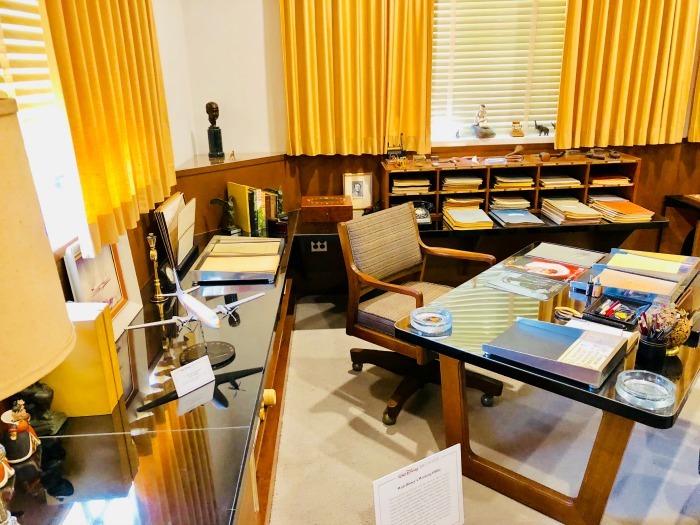 When you walked into the formal office, Walt’s desk was straight ahead. 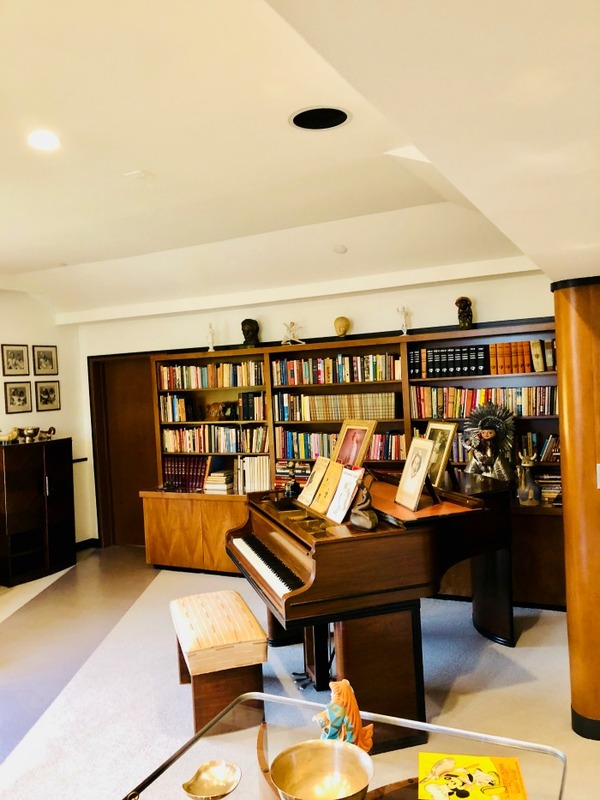 To the right of the entrance was a sitting area and a grand piano. Oh, to be a fly on the walls during the 40s, 50s, and 60s. Can you imagine who performed in this room? 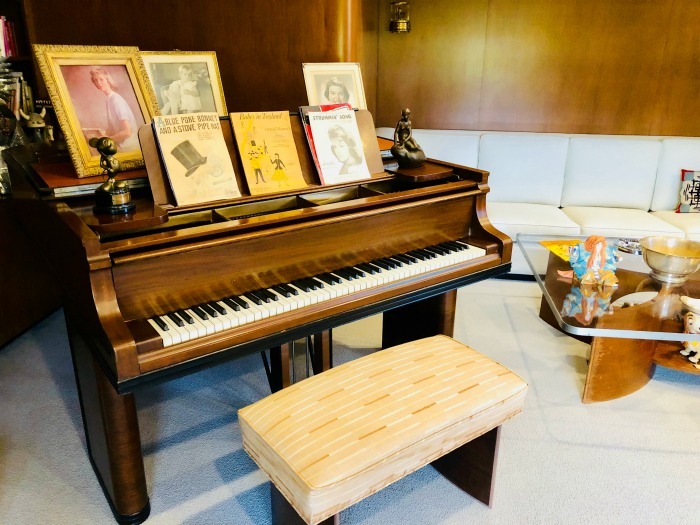 To this day, the only person who is remaining who may play on this grand piano is Richard Sherman, who played back in the day with Walt Disney nearby. I had the privilege of seeing Richard Sherman perform in a Disneyland parade celebrating It’s a Small World years ago. Don’t know who Richard is or who his late brother Robert Sherman was? He and his brother wrote songs for Disney’s “Mary Poppins”, “Jungle Book”, and even “Winnie the Pooh”. You know their work, trust me. You’ll notice in the middle top of this photograph a small gold cage hanging. This was a gold-caged automation bird which is said to have prompted Walt Disney to develop audio-Animatronics technology! I’m thinking “Enchanted Tiki Room”. Anyone else? 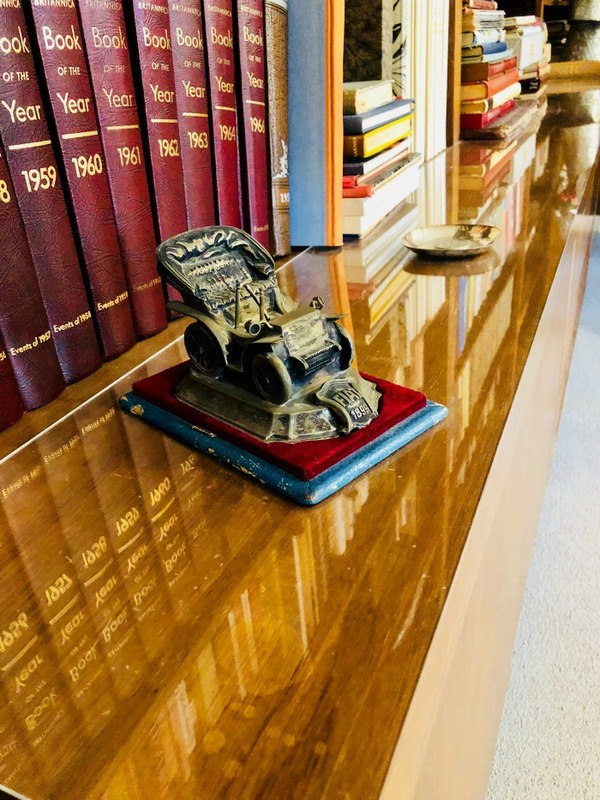 Over by the bookcase, I spotted this little FIAT statue. I found it to resemble the cars in Mr. Toad’s Wild Ride at Disneyland. I also spotted this doll in the corner behind the grand piano. Likely a gift, I think she resembles the dolls from “It’s a Small World”? Inspiration? From his office, he had incredible views over what is now the Frank G. Wells building. 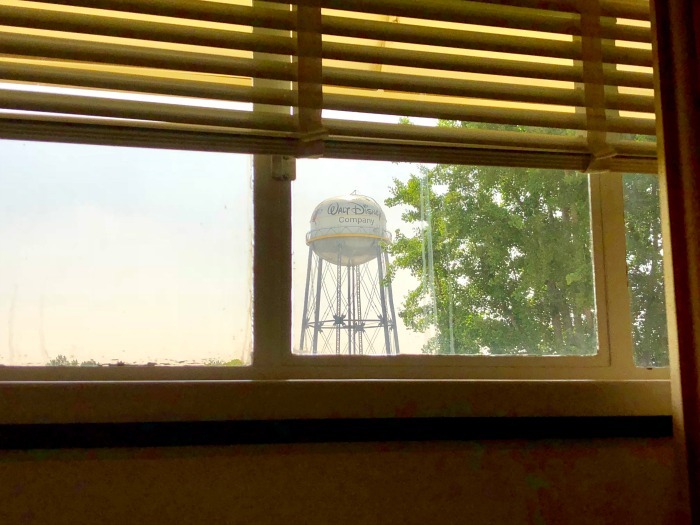 I quickly looked through the blinds in the office and realized Walt could also easily see the Walt Disney Studios water tower. Much like you or I, Walt had one area to greet guests and another to get the real work done. Walt’s working office is likely a little cleaner today according to reports. Ha! I can only imagine, knowing myself how sometimes creative folks have the messiest desks (mine included). It is said that Walt Disney arrived here at 8:30 each morning to handle the day to day business with directors, producers, writers, artists, etc. If there was one item I could have walked away with, it was this original Walt Disney leather briefcase or bag. 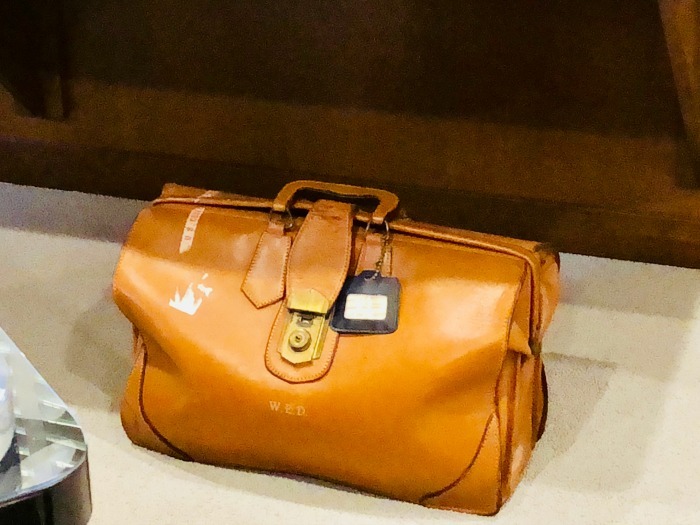 Look closely, you’ll see Walt’s initials on the bag. 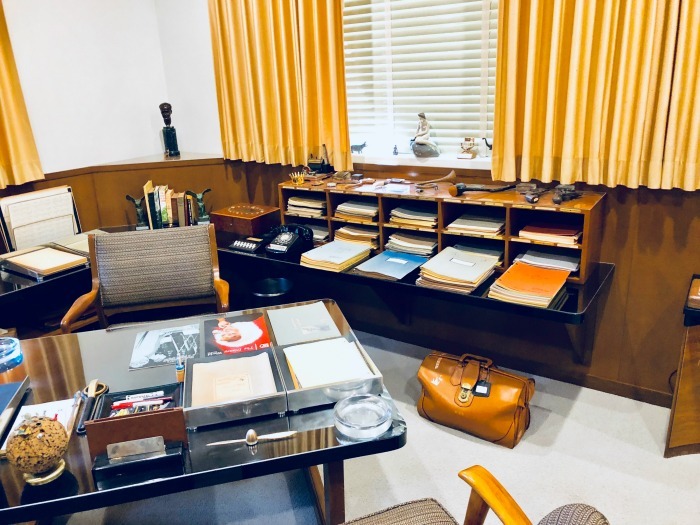 Opposite Walt’s working desk, there was another sitting area along with a large bulletin board. You could tell this was a working bulletin board and I couldn’t wait to get closer. 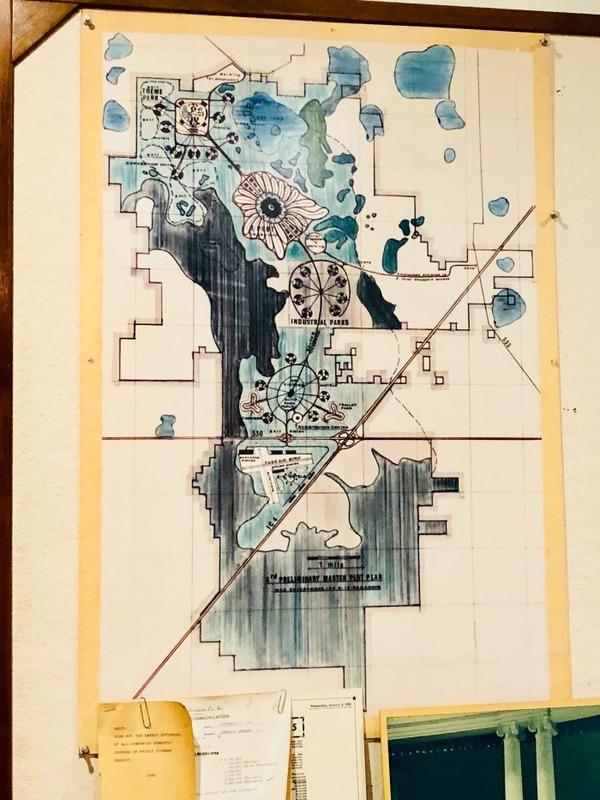 Of course, at the time of Walt Disney’s death, Disney World had not opened yet (not until 1971), so here is a glimpse – preliminary sketches. 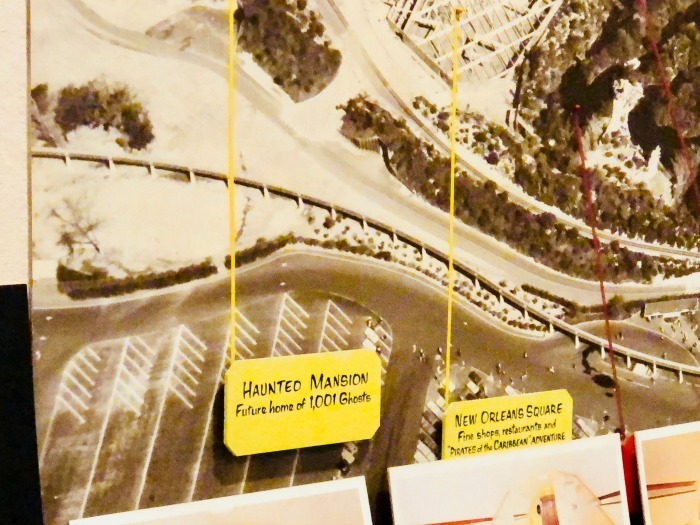 Let’s take an ever closer look at what was to become Magic Kingdom. The Haunted Mansion attraction is said to be the future home of 1,001 ghosts, but you and I know it is the place of only 999 haunts. So what happened to the other 2 ghosts? Only Disney knows! 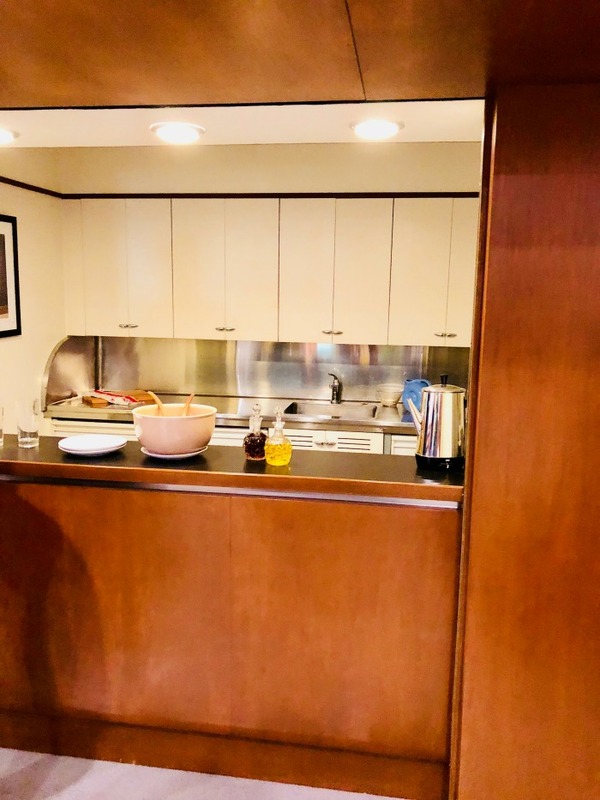 A working office wouldn’t be complete with a hidden kitchen (yes, the half-doors above the bar close)! Stemware featuring Disney’s monogram were on the bar. Walt also had a private room beyond the offices designed for overnight use if necessary, though rarely used. 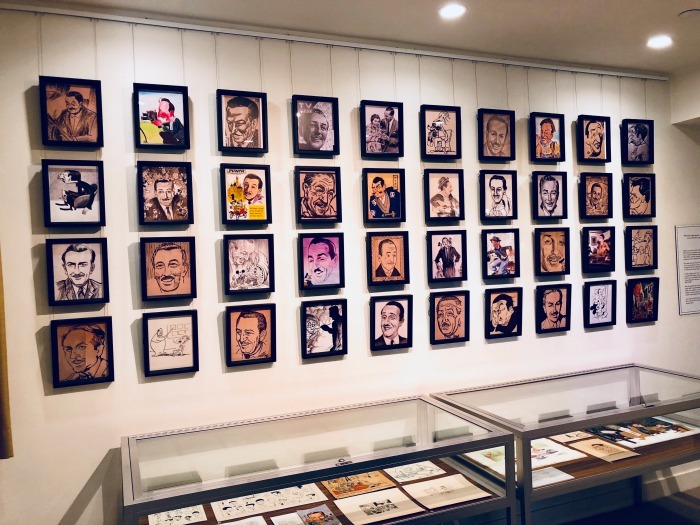 This has now been turned into a gallery space featuring the many faces of Walt Disney. 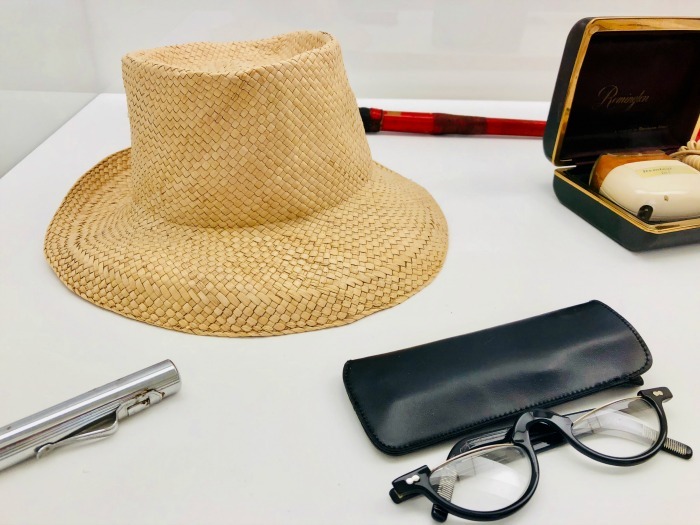 It was here I spotted more of Walt Disney’s personal items, from his hat to his eyeglasses. 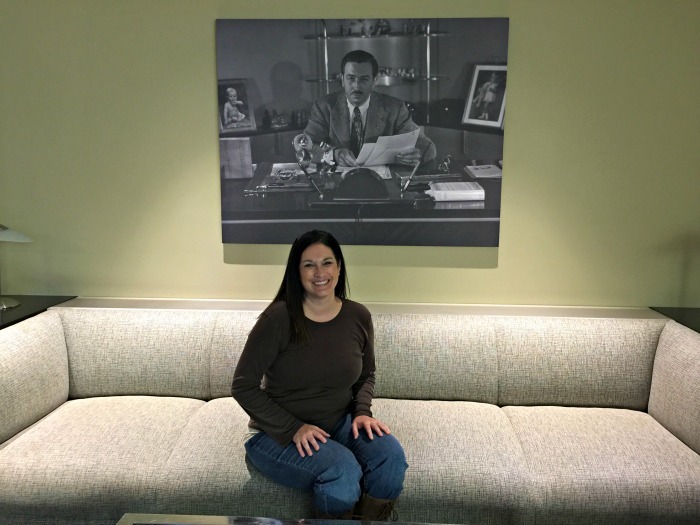 If you ever get the opportunity to tour Walt Disney’s office and Suite 3H – take it! Since we were celebrating the 65th anniversary of PETER PAN (available on Digital 5/29 and Blu-ray 6/5) and the in-home release of the Walt Disney Signature Collection Edition of the film, it was such an added bonus to be able to walk the halls where it was actually created. Coming Soon: We had the chance to see original Peter Pan artwork at the Animation Research Library! 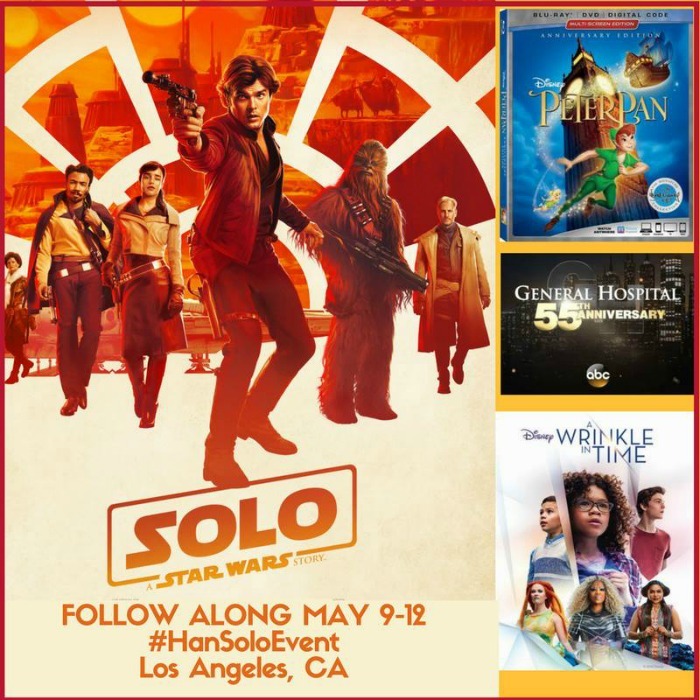 SOLO premiere – you’ve got to see my red carpet dress! What an absolutely incredible experience! 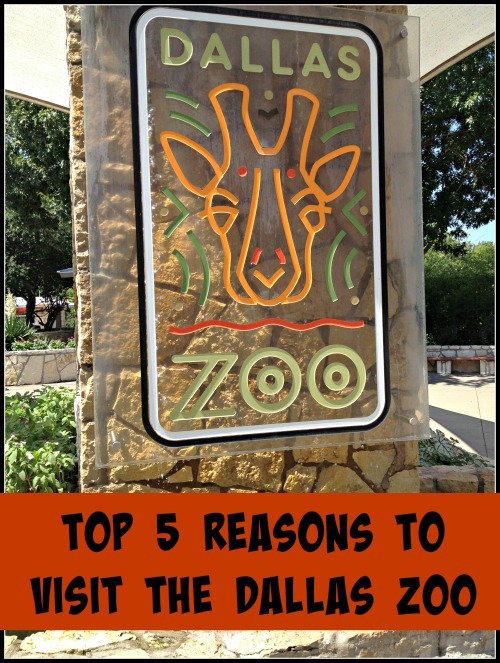 It’s seriously like taking a walk back in time to the magical days of Walt! Oh my goodness! 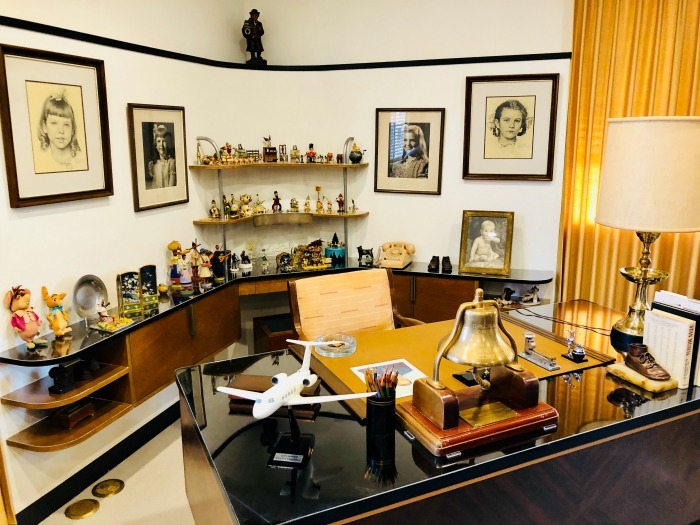 I would LOVE to tour Walt Disney’s office suite! 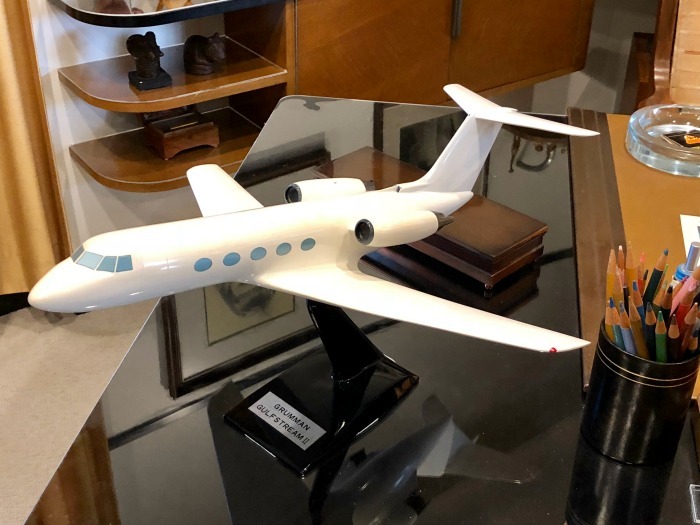 SO many amazing treasures in those offices. Yes! I have so many more photos too, I will probably have to do another post! This is so neat!!! 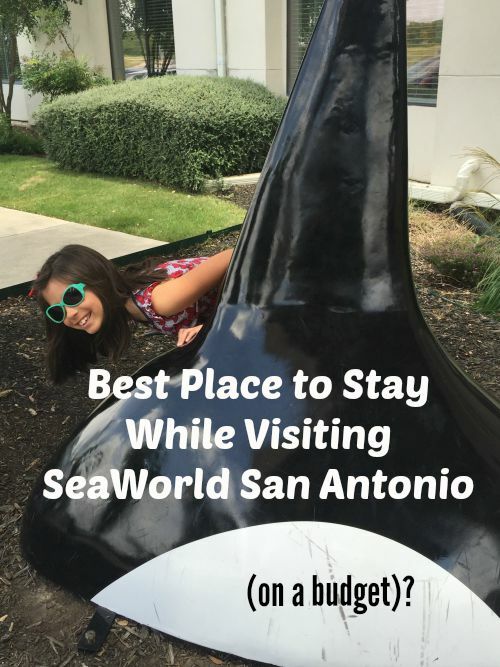 Didn’t know this even existed until this post! !